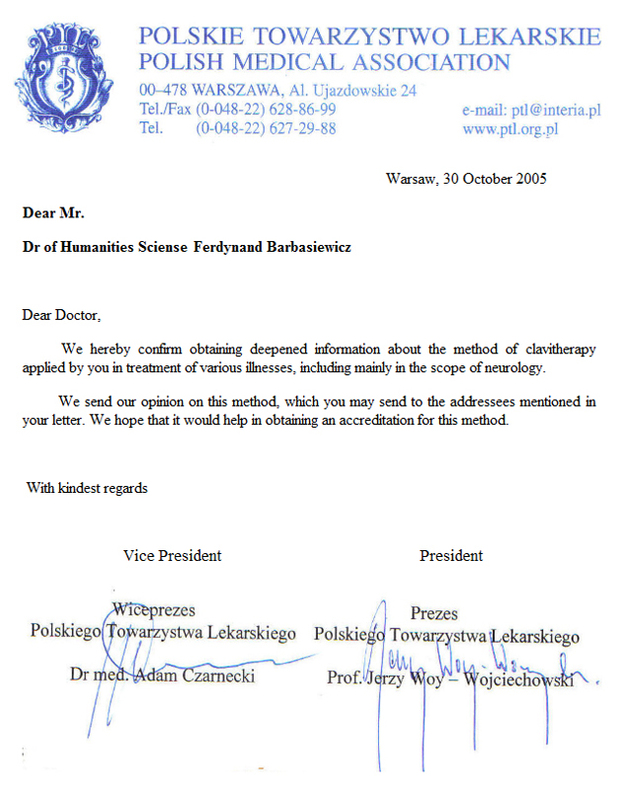 presents an easy instruction of the simplement and non-invasive molecular method in the dermovisceral method (skin – internal) biocybernetic clavitherapy for preventing, by the stimulation (impulsion) from 1100 disease entities by the proper algorithms and the network of functions to the characteristic nosologic units. By choosing the proper disease entity, with the gained method of prevention and illness control, in an easy way you can improve yours and your family’s health condition, without purchasing expensive medicines, which by the way nowadays are less possible to buy, because of their price. Especially it refers to those disease entities, for which the modern academic medicine doesn’t have effective medicines (psychological, neurotic, psychosomatic, mental, infective disorders, for example viral hepatitis type A.B.C. can be eliminated by the selective self-antibodies in 10 days with double blood test after the clavitherapy treatment; similarly the elimination of anemia and leucopenia; demyelination neuropathy and polyneuropathy in the conductivity of nervous signals in nerve fibers disorders; with the EMG verification; the earliest neoplasm diagnosis, even those malignant and their elimination in 10 days by self-antibodies; faulty posture correction: scoliosis; lordosis reconstruction; herniated disc elimination and many other difficult and treatment resistant health disorders. This is an alternative method for men’s health conditions’ improvement, tested and verified with very good results by different physicians with various specializations. 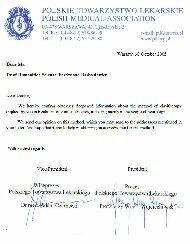 In march 2004 the 3rd edition of the manuals “Clavitherapy” („Klawiterapia”) and “Atlas of clavitherapy” („Atlas klawiterapii”). 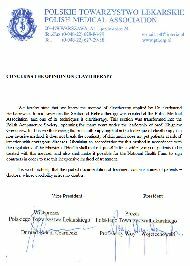 From 1988 I organize the clavitherapy trainings for the professional therapists, physicians, physiotherapists, clinical psychologists, physiologists, molecular biologists, special education teachers, nurses (graduated from the Nursing Department – Medical University, bioenergotherapists with the knowledge of anatomy and physiology. 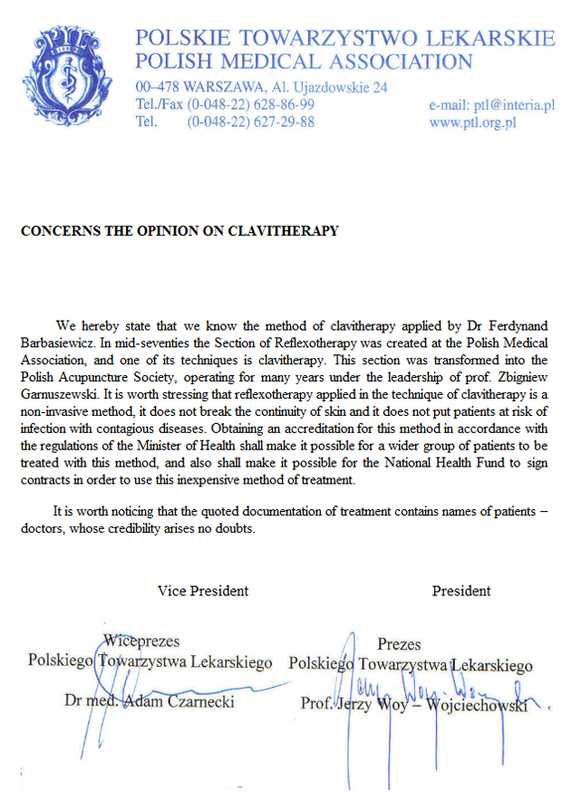 On 30th October 2005, on the 200th Anniversary of the Polish Medical Association, which from many years monitored the effectiveness of the clavitherapy, has written the positive opinion on biocybernetic clavitherapy for: Ministry of Health, National Health Fund, managers of the specialist medical institutes, subordinated to the Ministry of Health, Medical Academies/Universities’ Chancellors, managers of the clinical hospitals, sanatoriums, NGOs, and those who take up the health prophylactic and propagate it. Recommending with the whole responsibility the non-invasive and very effective molecular method of the cybernetic clavitherapy, I send you my best greetings and wish you lots of successes in self–regeneration and treating the disordered human body.